Cattle prices worse than last year, but who’s complaining? Home > Cattle > Cattle prices worse than last year, but who’s complaining? 21 Jun Cattle prices worse than last year, but who’s complaining? 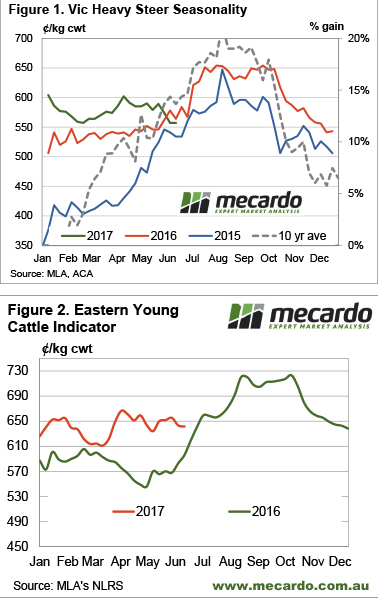 It hasn’t happened to the Eastern Young Cattle Indicator (EYCI) yet, but we have a few slaughter categories which have moved below year ago levels. It’s been a while since producers were getting less money than the year before, in fact it’s been three years, but is anyone complaining? It’s been nearly two months of cattle prices tracking sideways, as just as the market seemed to avoid the usual autumn decline, the winter rally is taking it’s time to appear. Figure 1 shows the Victorian Heavy Steer Indicator, which is a pretty good proxy for slaughter cattle on the east coast. Since 2015 there hasn’t been a week when the Vic Heavy Steer was lower than the previous year. In fact, we had to go back to February and March 2014 to find a time when the Vic heavy steer was lower than the year earlier. At that time the Indictor was at 310-320¢/kg cwt, just 5-10¢ below 2013 values. This week’s price was 557¢/kg cwt. So is anyone complaining about prices? We can see from figure 1 that producers with heavy steer might be disappointed they didn’t sell a month ago, with the Vic Heavy Steer down 30¢ in that time. This equates to around $105/hd on a 350kg cwt steer, which hurts a bit. In terms of the trade, if these steers were bought back 18 months ago, the EYCI was 600¢/kg cwt. Convert to live weight and add a bit of basis, and they might have cost around $1,000/hd at 300kg lwt. Selling this week as heavy steers they would have returned $1,950/hd. We’re not sure anyone is complaining about a $950/hd gross margin. Seasonality suggests cattle prices are due to rally, and Matt’s analysis earlier this week on processor margins suggests there is room for slaughter cattle to begin their winter appreciation. Young cattle prices remain strong, as restocker and feeder demand is still robust enough (figure 2). We might see slaughter cattle rise without young cattle for a start. Although the very dry weather outlook for the next 8 days suggests we might be waiting a bit longer yet.